A very common cause of shoulder pain is ‘impingement’. Essentially it is caused when the greater tuberosity (a knuckle on the top of the head of humerus) comes into contact with the acromion (roof of the shoulder). Classically patients experience pain in the upper arm just below the shoulder on any activity but especially when the arm is lifted to the side when trying to touch the head. Patients may also experience catching or clicking in the shoulder, pain at night when trying to sleep or problems dressing or driving. The shoulder is made up of a ball on a flat plate (the socket). The socket needs to be flat to enable the huge range of movement normally possible at the joint. Over the top of the socket is the roof of the shoulder called the acromion. Under the acromion and surrounding the joint are 4 muscles called the rotator cuff, which end in tendons attaching to the humerus. These muscles are important for centreing the head of humerus (the ball) on the flat plate so that the hinge works more effectively (like a loft hatch). They are also important for the finer movements like rotation. The space under the acromion is quite narrow and if that space is compromised further for whatever reason, the tendon becomes squashed between the humeral head and the acromion. This is impingement. There are numerous causes and include the bursa becoming inflamed, a spur of bone forming under the acromion or a rotator cuff tear from injury or tissue degeneration. Impingement tends to be secondary to another problem rather than the main issue. You will examined in the clinic and after that an X-ray may be requested to look for arthritis or calcium in the tendons which can form spontaneously for no apparent reason. An ultrasound scan can be used to assess the rotator cuff muscles. This is a very useful, harmless scan and is dynamic. This means that the radiologist can move your shoulder whilst scanning so can gain a lot of information about the movement and quality of the tendons. Treatment should start with simple measures first since they are often successful. Painkillers and physiotherapy can be tried but sometimes physiotherapy can initially aggravate the symptoms. Your doctor may offer you an injection which would be placed under the roof of the acromion and into the bursa. This may include a steroid which aims to reduce the inflammation in the bursa and therefore reduce the quantity of tissue in the space and therefore the pain. In many cases, an injection alone is all that is required to settle the symptoms down. Often the injection gives relief but is short lived but if the injection allows some physio to commence then progress will have been made by the time the pain returns. Further injections can be offered depending on the specific problem and effect of previous injections. Ultimately if these steps fail then you may be offered surgery. 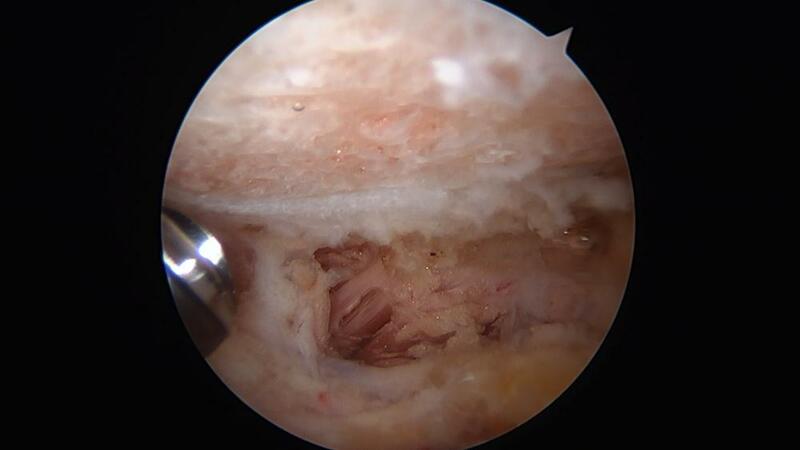 This is an arthroscopic (key-hole) operation which is usually done as a day-case under a general anaesthetic (see shoulder arthroscopy section). During the procedure the surgeon can examine the whole joint to check for other problems. The space above the main joint is entered with the camera and a small shaving of bone is removed from under the acromion to make more space. See figs 5 and 6. This is called a subacromial decompression. 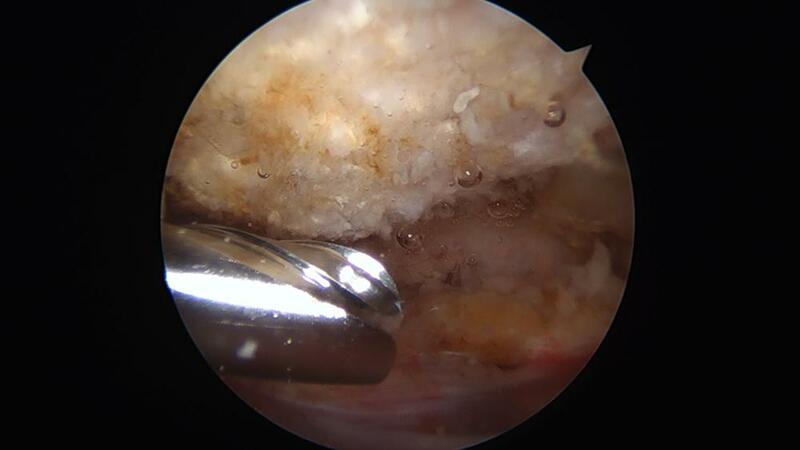 The shavings are tiny and get washed out in the fluid that washes through the joint during the operation. 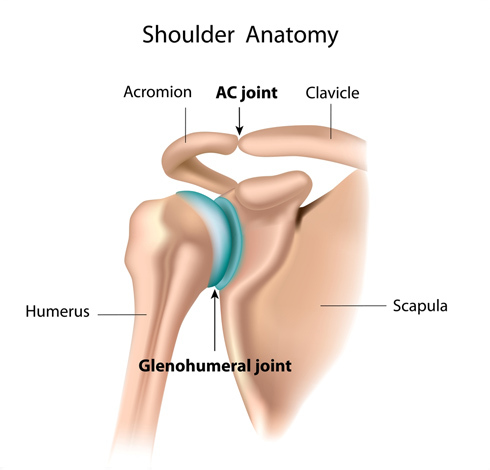 The acromioclavicular joint (ACJ) is the small joint between the end of the clavicle (collarbone) and the acromion. It doesn’t usually move very much except on above-shoulder activity. Nonetheless, it can become worn (arthritic) and painful. It is very close to the area of the subacromial decompression and therefore is comm only addressed during the same operation. A burr (small drill) is used to remove the end of the clavicle so that there is more space in the joint and the ends no longer rub together. See figs 7 and 8. Arthroscopic Subacromial Decompression. Acromion after bursal tissue removed and before a bony decompression is performed. After bony decompression has been performed with a burr. The anterior edge is bevelled to the level of the deltoid muscle. After the surgery you would normally be allowed home the same day. You will be in a sling for your comfort. If the anaesthetist has given you a ‘block’ (see shoulder arthroscopy), your shoulder and arm will be numb for 12 hours or so after the surgery. This is a good thing. When your block starts to wear off you will be aware of pain in your shoulder and arm which you should manage with painkillers. Gradually you should start to move your arm out of the sling, performing general light activity including washing, dressing and preparing meals. Your shoulder will feel sore but nothing has been repaired so there is no damage that can be done by moving your shoulder. You will just be restricted by your symptoms. The physiotherapists may arrange to see you after a few weeks to check your progress. By 2-3 weeks you should be comfortable to stop using the sling. I would expect that by 6 weeks after the surgery you will have begun using your shoulder for most light activity, do not require much in the way of painkillers and may be comfortable to drive. By 12 weeks most patients have fully recovered but a small proportion of patients take longer and a very small number of patients do not derive any benefit from subacromial decompression. Prediction of outcome from subacromial decompression depends really on the cause of the problem. The underlying cause of the impingement symptoms should be sought prior to an operation. If there is a primary problem like a bony spur under the acromion or an inflamed bursa then recovery is likely to be good. If there is a secondary problem like a rotator cuff tear or instability, then recovery may be unsatisfactory unless the root cause is addressed. Most patients with impingement settle with non-operative treatment and the remainder with pure primary impingement syndrome would be expected to settle with subacromial decompression.